WHAT: Washington Nationals fans will have a chance to run for office when they try out to become one of the Racing Presidents on Sunday, January 17 at the Washington Nationals Youth Baseball Academy. Candidates looking to fill the shoes of George, Tom, Abe, Teddy and Bill have been invited to the Youth Baseball Academy to perform a freestyle dance, run a 40-yard dash and participate in two races from center field to first base. In addition, each applicant will be required to answer questions from a panel of Nationals entertainment staff members. Racing hopefuls were pre-selected from a pool of applicants who submitted their cover letter and resume. Participation in the tryout is by invitation only and not open to the public. Tryouts will take place regardless of weather conditions. 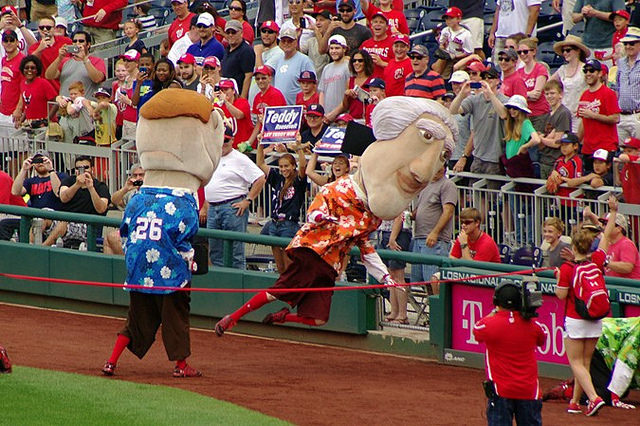 Developed in 2006, the award-winning Racing Presidents are 12-foot oversized mascots who compete in the GEICO Presidents Race during the fourth inning of every Nationals home game. The popular figures can be seen promoting the team and its community efforts at Nationals Park and around the D.C., Maryland and Virginia region. For more information on the Racing Presidents, visit nationals.com/racingpresidents.